The best freebies from the last seven days. Free Games of the Week is taking a break until 2019, but before we wrap it up in cling film and put it in the fridge, let's take a look at some of the best freeware games released over the past week (or thereabouts). Read on for room escape, for whatever 'immure' means, for tasty, tasty nectar, and for a funny, silly yard sale with colourful characters. For more, check out our list of the very best free computer games you can play on PC. Enjoy! Ahead of a Kickstarter starting mid-October, here's a really rather good demo for sidescrolling horror game IMMURE, which plonks the unwitting player inside a freaky realm of shifting dimensions. It's one of those games where you have to hide from the beasties rather than fight them head-on, and those tend to be the scariest, so get ready to cower from a nightmare creature that will rip your head clean off when it does you in. IMMURE feels polished, and the setting is damned intriguing. Now if you'll excuse me, I'm running back to my hiding place. [GENRE A] meets [UNLIKELY GENRE B] in the enjoyably cartoony and over-the-top Beatdown Dungeon. Phil Airdash's game is partly a top-down, procedurally generated dungeon crawl, but one that transitions into a Street Fighter-style fighting game whenever you encounter an enemy. Now, this isn't some divine combination, like peanut butter and chocolate, or peanut butter and anything, but the real-time, frenetic scraps do offer a nice change of pace from the more sedate dungeon wandering. If you're terrible at fighting games, like I am, rest assured that you can button mash, and even make use of items to, for instance, recover your health. 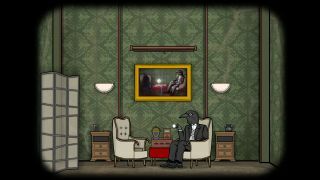 The Rusty Lake universe is a fairly big one at this point, encompassing several free room escape games, and a handful of adventurey puzzlers with nominal price tags. Cube Escape: Paradox ventures into the realm of transmedia, meaning it's another free room escape, but also a free short film, which I'll embed below. I've not watched the film, but I have poked around the satisfyingly puzzle-filled room, which (as you might expect from the series) is full of contraptions to interact with and objects to collect, while it's supported by a beautiful ambient soundtrack. If you manage to finish Paradox, there's an additional chapter you can pay for that bungs in more story, a different ending, and harder puzzles. Loren Schmidt's latest freeware game is a work of interactive fiction, and one that feels a lot more interactive than most, thanks to its snappy presentation and lovely text-scrolling. A short, strange story that will be expanded with Cycle B, and that will ultimately pave the way for a more fully fledged gardening game (! ), Nectar Thief deposits you in an evocatively sketched world of interlocked rooms and of curious, collectible objects: a place that defies easy categorisation. The concept of a 'yard sale' doesn't really exist in the UK, as we sell our unwanted tat from the boots of our cars, or (more likely) we simply fling it from those cars and onto a grassy verge. However, thanks to the oddly named Yard Sard, I can finally experience the thrill of selling old rubbish to passers-by for an insultingly low fee. This far-too-brief adventure-puzzler-thing presents you with a series of customers, awarding points every time you match their needs with one of the items cluttering up your yard. I restarted a few times, and was given a fresh handful of customers, some of whom were new, some of whom had been shuffled about, so there is some replay value—and you'll likely want to restart, given how abruptly the game comes to an end. Despite that, there's much to enjoy, from the amusing dialogue, to the (often wonderful) character artwork.